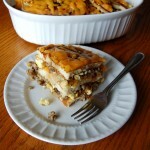 A sausage, egg, and cheese, pancake casserole that tastes like a McGriddle! Preheat oven to 350 degrees. Spray a 2 1/2 quart baking dish with cooking spray, set aside. In a large skillet, cook sausage on medium-high heat until done, crumbling into pieces as it cooks. In another skillet, melt 1 tablespoon butter, cook eggs with a rubber spatula, gently pushing the eggs to the center, until cooked through. Stir eggs in with the sausage. To assemble: Place 5 pancakes in a single layer on the bottom of the baking dish, making sure the pancakes are touching or slightly overlapping. Sprinkle a 1/4 cup of cheese over the pancakes. Add 1/2 of the sausage/egg mixture to the pan. Top with an additional 1/4 cup cheese. Drizzle with syrup. Repeat layers, starting with pancakes. 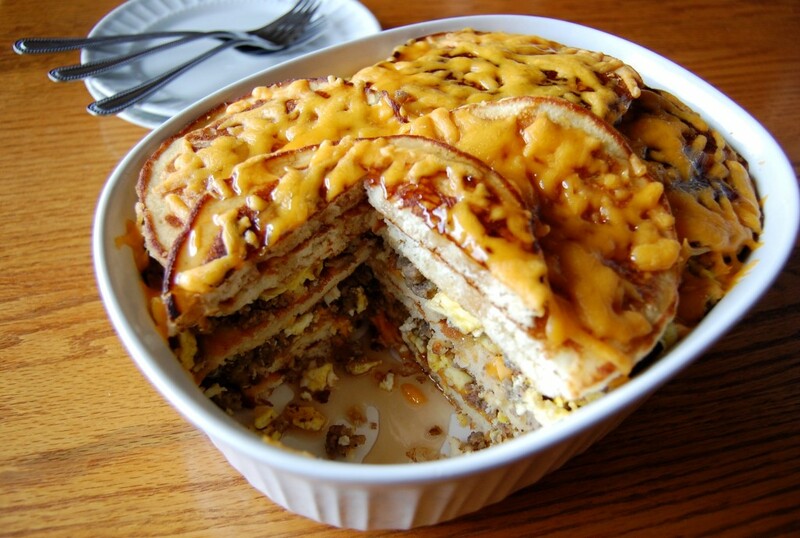 Top with final layer of pancakes. Sprinkle with remaining cheese. Bake for 15 minutes until the cheese is melted. Drizzle the top with syrup. Slice and serve with additional syrup at the table. Cook's Note: If making homemade pancakes, add 2 tablespoons of maple syrup to the batter before cooking.